Each year, August 14th is recognized as Navajo Code Talkers Day in gratefulness for the role native Navajo speakers played during World War II. The term “code talkers” is strongly associated with bilingual Navajo speakers specially recruited during World War II by the Marines to serve in their standard communications units in the Pacific Theater. 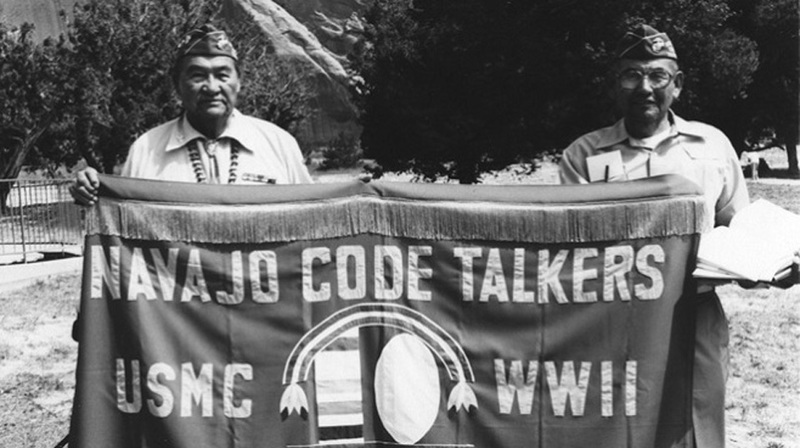 Code talking, however, was pioneered by Cherokee and Choctaw Indians during World War I.
Philip Johnston, a civil engineer for the city of Los Angeles, proposed the use of the Navajo language to the U.S. Marine Corps at the beginning of World War II. Johnston, a World War I veteran, was raised on the Navajo reservation as the son of a Christian missionary to the Navajo. He was one of the rare non-Navajo who spoke the language fluently. Navajo has a complex grammar, and is not mutually intelligible enough with even its closest relatives within the Na-Dene linguistic family. It was still an unwritten language, and Johnston thought Navajo could satisfy the military requirement for an undecipherable code. Navajo was spoken only on the Navajo lands of the American Southwest. Its syntax and tonal qualities, not to mention dialects, made it unintelligible to anyone without extensive exposure and training. One estimate indicates that at the outbreak of World War II, fewer than 30 non-Navajo could understand the language. Early in 1942, Johnston met with Major General Clayton B. Vogel, the commanding general of Amphibious Corps, Pacific Fleet, and his staff. Johnston staged tests under simulated combat conditions which demonstrated that Navajo men could encode, transmit, and decode a three-line English message in 20 seconds, versus the 30 minutes required by machines at that time. The idea was accepted, with Vogel recommending that the Marines recruit 200 Navajo. The first 29 Navajo recruits attended boot camp in May 1942. This first group created the Navajo code at Camp Pendleton, Oceanside, Calif. The Navajo code was formally developed and modeled on the Joint Army/Navy Phonetic Alphabet that uses agreed-upon English words to represent letters (Alpha, Bravo, Charlie, Delta, etc.). The Navajo Code Talkers were mainly Marines. As it was determined that phonetically spelling out all military terms letter by letter into words—while in combat—would be too time-consuming, some terms, concepts, tactics and instruments of modern warfare were given uniquely formal descriptive nomenclatures in Navajo. For example, the word for “shark” referred to a destroyer, and “silver oak leaf” to the rank of lieutenant colonel. Several of these coinages, such as “gofasters” referring to running shoes or “ink sticks” for pens, entered Marine Corps vocabulary, and are still commonly used. A codebook was developed to teach the many relevant words and concepts to new initiates. The text was for classroom purposes only, and was never to be taken into the field. The code talkers memorized all these variations and practiced their rapid use under stressful conditions during training. Uninitiated Navajo speakers would have no idea what the code talkers’ messages meant; they would hear only truncated and disjointed strings of undecipherable speech. As the war progressed, additional code words were added on and incorporated program-wide. 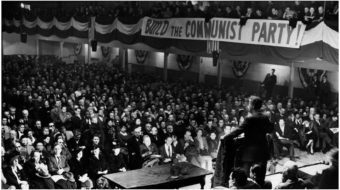 In other instances, informal short-cut code words were devised for a particular campaign and not disseminated beyond the area of operation. To ensure a consistent use of code terminologies throughout the Pacific Theater, representative code talkers of each of the U.S. Marine divisions met in Hawaii to discuss shortcomings in the code, incorporate new terms into the system, and update their codebooks. These representatives in turn trained other code talkers who could not attend the meeting. For example, the Navajo word for buzzard, jeeshóóʼ, was used for bomber, while the code word used for submarine, béésh łóóʼ, meant iron fish in Navajo. Guadalcanal, Tarawa, Peleliu, Iwo Jima: The Navajo code talkers took part in every assault the U.S. Marines conducted in the Pacific from 1942 to 1945, transmitting messages by telephone and radio. The deployment of the Navajo code talkers continued through the Korean War and after, until it was ended early in the Vietnam War. It wasn’t until 1968 that the existence of the Navajo Code Talkers program was declassified by the military. Long unrecognized because of the continued value of their language as a security classified code, the Navajo code talkers of World War II were honored for their contributions to defense on Sept. 17, 1992, at the Pentagon. In the year 2000 they received Congressional medals. The Navajo code is the only spoken military code never to have been deciphered. The last of the original 29 Navajo who developed the code, Chester Nez, died on June 4, 2014, but some other code talkers, of the approximately 400 Navajos who were trained, are presumed still living. An archive of video interviews with surviving code talkers can be seen here. 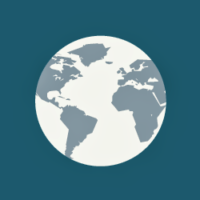 For further information about the Navajo Nation, see this website. Sources: Navy & Marine Corps WWII and Wikipedia.